Why is Scale Control Important? Before you decide to get magnetic water treatment for scale prevention in your home or business, you need to understand what scale is and how it happens. The substance known as calcium scale is a thick and hard coating of CaCO3, which stands for calcium carbonate. Scale prevention without a water treatment can be challenging because it forms inside of pipes, appliances that run on water, plumbing fixtures, and heating elements. As water that contains calcium comes into your home or business, it disrupts the equilibrium between calcium and carbonic acid. Hydrogen carbonate is a naturally weak compounded chemical that will break down in response to increased water movement or temperature. This can quickly lead to the need for professional scale control because parts of biocarbonate, calcium, and magnesium attach to the wetted surfaces of equipment, appliances, and the plumbing system. The most common ones include water heaters, plumbing fixtures, and heating elements. Without scale control, these appliances and other elements will not work as expected. Your water will come out cold, your clothes and dishes will have spots on them, and it may be uncomfortable to take a shower. These are just a few of the consequences of ignoring scale build-up and the need to obtain magnetic water treatment for scale prevention. Without scale control, the buildup will continue to become thicker and more challenging to remove over time, increasing energy costs and the need for costly repairs or replacements. How Does Calcium Affect Pipes and Other Fixtures? Besides your water being more challenging or even unpleasant to use, fixtures, equipment, and appliances with a buildup of calcium are far less efficient than those where the owner has taken appropriate scale control measures. Homeowners will notice higher costs to use equipment and appliances such as their water heater, washing machine, dishwasher, ice maker, coffee maker, and humidifier. Business owners will see an increased cost associated with operating their heating boilers, coffee machines, ice machines, and other common equipment available to employees. Regardless of the equipment location, it can develop harmful bacteria that can make people ill if calcium builds up for a long period before seeking magnetic water treatment for scale prevention. When you have hard water, it is important to arrange for magnetic water treatment for scale prevention as soon as possible. If you wait too long, the treatment may be less effective at breaking up the scale and removing the bacteria. 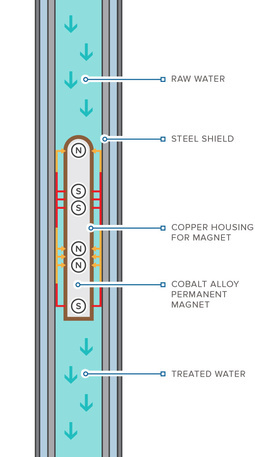 As its name implies, magnetic water treatment for scale prevention works by water flowing through a chamber and being exposed to a series of reversing polarity, alternating permanent magnetic fields. As water passes through pipes, a hot water heater, or other equipment, it reacts to the magnetic force field by changing the fundamental structure of the hard water. It does not remove any minerals from the water. Rather, the scale control treatment makes it more difficult for minerals to stick to the wetted surfaces of the pipes and equipment it is traveling through and form scale buildup. A traditional salt-using water softening treatment replaces calcium and magnesium present in water with sodium during an ion-exchange process. It does have proven effects as a scale control procedure that softens water and is easier on a structure’s plumbing system, water heater, and other equipment and appliances. The need to regularly add more salt to the system, which can become costly and cumbersome. It can be more challenging to rinse soap off of your body when showering, and out of clothing in the laundry completely when using water infused with sodium. Traditional water softeners dump all removed calcium and magnesium down the drain, along with the chloride part of the salt. This typically results in a significant loss of water during the regeneration cycle, as well as chloride contamination into the waste system. Sodium in the softened water can cause additional problems, including corrosion in equipment and plumbing systems. Magnetic water treatment for scale prevention is the right choice for you if you prefer not to have any sodium in your water at all. Scale control is not something that most people think about until they experience the effects of hard water. The best way to ensure that you always have pleasant-tasting drinking water, soft clothes, clean dishes, hot water, and a strong plumbing system is to arrange for magnetic water treatment for scale prevention.